These Savings Incentive Program recipients, our first class, enrolled in the program in 2010 and graduated in 2012. Nathan Anderson raises corn and soybeans near Cherokee. He also added a cow-calf enterprise to his farm. Nathan’s plans include securing a long-term land base, increasing his crop rotation to include small grains and alternative crops, increasing pasture acres to grow the size of his cow-calf operation and adding additional livestock species. Garrett Caryl has been an aspiring farmer since age three. He followed his dream and now operates G-Man Farms near Colo. Garrett raises organic corn, free-range chickens and organic pigs with his partner Rebecca Lamb. He plans to expand his farm acres and livestock to meet the needs of his customers and community. Garrett is excited to be part of the Savings Incentive Program, to meet and learn from other farms with similar goals while saving for his business development. Sara Hanson operates Prairie Sky Farm near Wesley. After accumulating experience on other farms out of state, she returned to Iowa in 2008 and purchased land to begin her own vegetable farm. She has been making improvements to her farm to allow her to grow and sell vegetables through community supported agriculture (CSA), farmer’s markets, her local food cooperative and restaurants. Sara is eager to be a part of the Savings Incentive Program for business-planning guidance and production education in addition to the funds that will help her further mechanize her operation. Jason Jones owns Wilted Leaf Farm within the Des Moines city limits. He classifies his nine-tenths-of-an-acre parcel as a testing ground where he raises leafy greens, head lettuce and root crops that he sells through the Iowa Food Cooperative and a local grocery. He is planning on purchasing land east of Des Moines on which to build a financially sustainable, small-scale family farm. Eric Madsen grew up on his family’s farm near Audubon. He recently returned to the farm to work while starting his own farming operation on land he purchased nearby. He saw a need for custom haying in his area so began a custom haying enterprise. 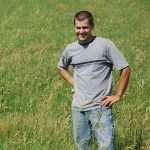 He has started rotational grazing and plans to add niche pork and poultry to his own farm operation in the near future. He is looking forward to the opportunities the Savings Incentive Program will provide to network with other farmers and feels the savings match will greatly help adding additional livestock to his farm. Ryan and Janice Marquardt raise broilers, turkeys, a laying flock, hair sheep ewes and cattle between Newton and Pella. Since purchasing land for their farm, Wild Rose Pastures, in winter 2007, Ryan and Janice have begun adding and improving structures to accommodate their growing operation. Ryan plans to make improvements using his savings match that will allow Wild Rose Pastures to increase its growing capacity. Alice McGary and Nicholas Leete are part of Mustard Seed Farm near Ames. Mustard Seed Farm rents them one acre of land where they grow vegetables, herbs and berries. There are no paychecks distributed at Mustard Seed Farm, where 1/3 of its product is sold through community supported agriculture (CSA) to pay for feeding their workers and people in need. Alice and Nicholas will use their match to reinvest in the farm and boost production. “Mustard Seed Farm runs on a small budget, and the Savings Incentive Program match will make a big impact,” says Alice. Ben Saunders manages Turtle Farm near Granger. This certified-organic fruit-and-vegetable farm supplies food to 170 families through their community supported agriculture (CSA) program, which has been in operation since 1996, one of the first CSAs in Iowa. Turtle Farm also sells food to restaurants, through an on-farm stand, and at a farmer’s market. Through the Savings Incentive Program, Ben wants to purchase farm implements to increase his capital-earning capabilities while planning to take over the operation of Turtle Farm or purchase farmland of his own. Joel Winnes began farming at 16 when his family moved to an abandoned farm in southeast Minnesota that they turned in to a grass-based dairy. He started as a herdsman for Merlin Gesing’s grass-based dairy in March 2008. Joel is growing his own dairy herd and plans to buy Merlin’s dairy herd spring 2012.